church are pastors and deacons (Phil. 1:1). Baptist polity through the years has affirmed two scriptural officers of a New Testament church, pastor and deacon. Baptists believe the Bible teaches that all Christians are called to serve and minister to others in Christ’s name, but some are called and gifted by God to function in specific roles of ministry, such as pastors and deacons. 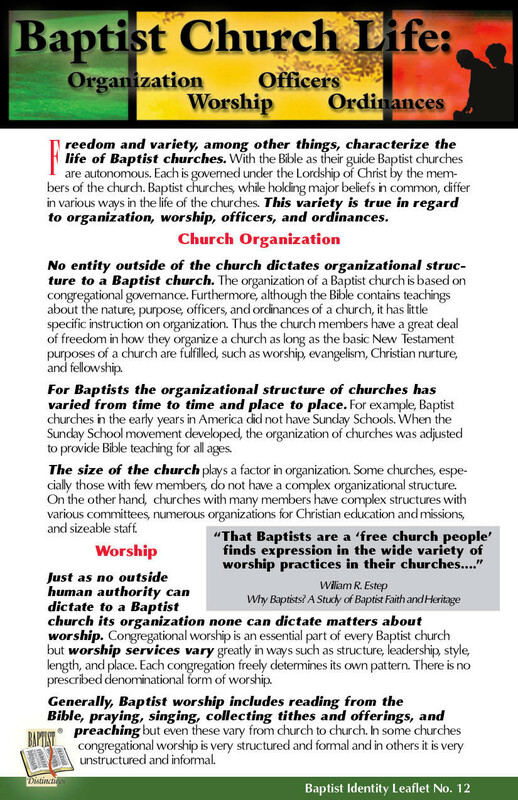 Baptists declare the office of pastor is one of two that a church patterned after New Testament churches should have. The Bible uses three words for the same office: elder, pastor and bishop. In the Greek language of the New Testament, these words indicate different functions and not different persons (Acts 20:17-28;1 Peter 5:1-5). 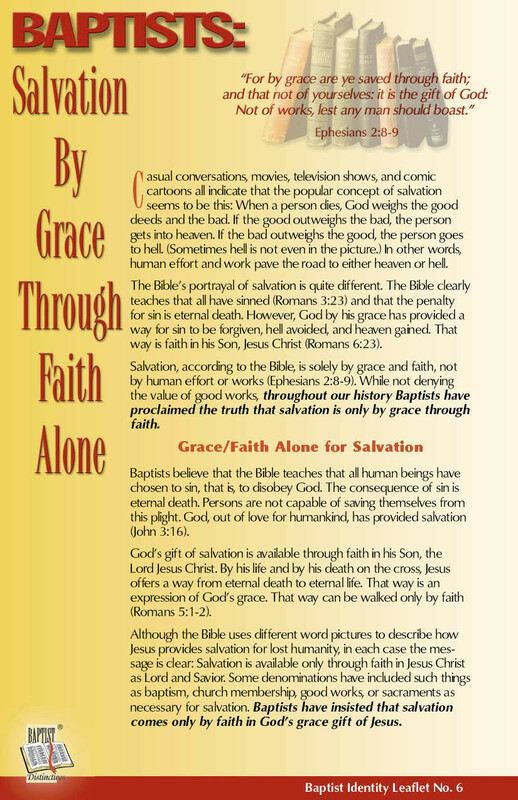 Baptists look to the Bible for the qualifications for persons to serve as pastor (1 Timothy 3:1-7; Titus 1:5-9). 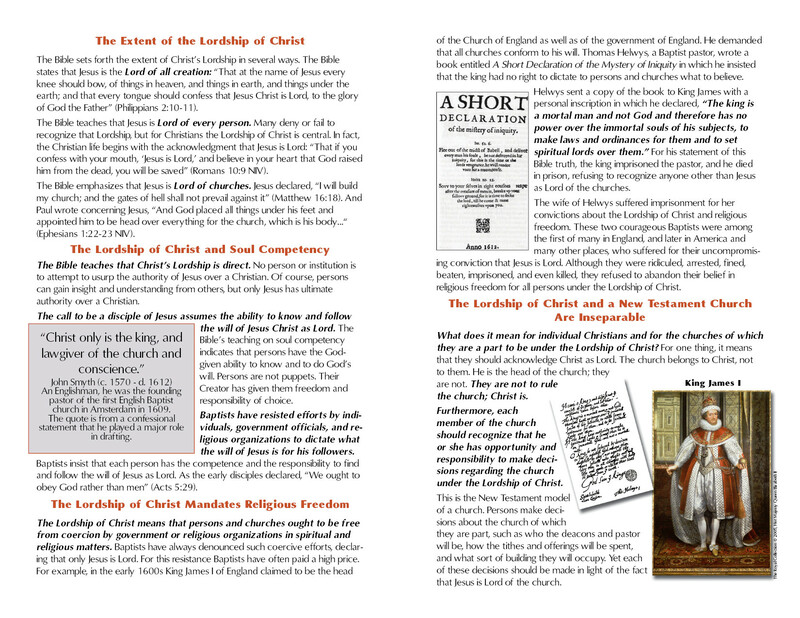 The qualifications fall generally into two categories—character and gifts for ministry. The office of pastor should be used to serve others, not in selfish or self-promoting ways. 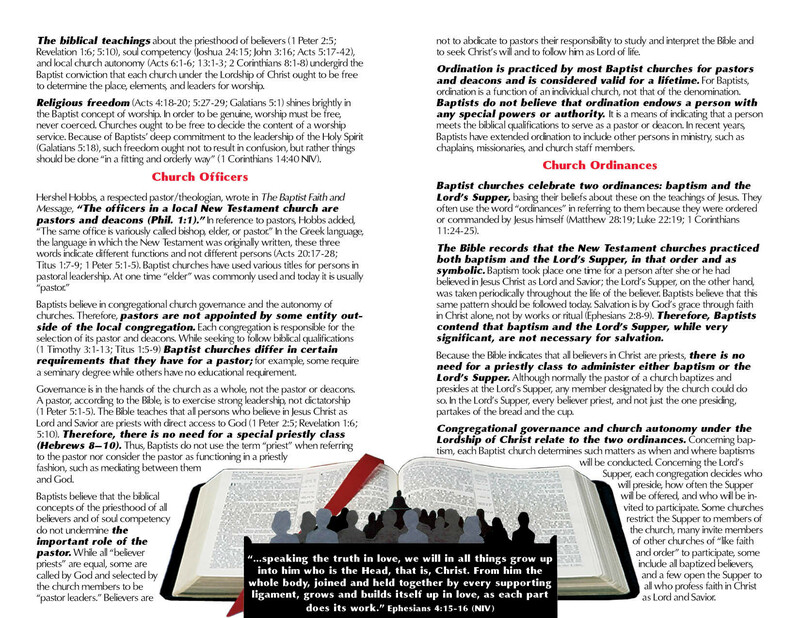 Each Baptist church selects (calls) the person to be its pastor. The specific process differs to some degree among churches, but the following pattern is followed by most. • When the church is pastorless,the congregation elects a pastor search committee to prayerfully evaluate the qualifications of various persons to be the church’s pastor. • After careful deliberation, the committee recommends to the church as a whole the person it believes God wants to be the pastor. • The prospective pastor visits the church and preaches “in view of a call.” The congregation then votes on whether or not to “call” the person. If the vote is favorable, the prospective pastor either accepts or declines. • A pastor serves in the church as long as both pastor and congregation agree the relationship should continue. The relationship of pastor and church is a very special one. Each has opportunities and responsibilities which, when properly met, make the relationship positive and productive. For example, the church should pray for, provide financial support to, encourage and assist the pastor in carrying out the purposes of the church. Likewise, a pastor should pray for, minister to, disciple and provide godly servant leadership for the people of the church. The second office in a Baptist church is that of deacon. Whereas pastors are usually selected from persons outside the membership of the congregation, deacons are selected from within the membership.The biblical qualifications for a deacon (1 Timothy 3:8-13) focus primarily on character and relationships within the church, family and community. Deacons are to be persons of impeccable character and deep faith who rely on the Holy Spirit. Acts 6:1-6 likely records the beginning of the role of deacons. They are to care for the physical needs of the congregation so that pastors can concentrate on spiritual needs. The deacons are not viewed as a governing body but as servant leaders. In a Baptist church the process of selecting deacons involves the entire congregation. Although churches differ in regard to the details of the process, the common practice is for the entire church to vote on who will be selected as deacons. The role of a deacon varies from church to church. In many churches, deacons are asked to evaluate and recommend major matters to be brought to the entire congregation for vote. Churches involve deacons in various ministries, such as visiting the sick, helping families in distress and providing relief to the poor. 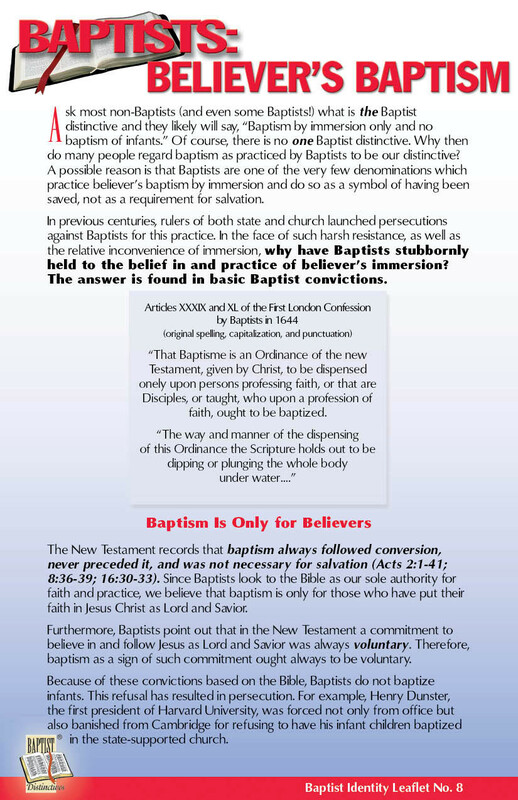 Baptists believe ordination does not endow a person with any special powers or authority. It is a means of indicating to churches and to the world in general that a person has been accredited as worthy to be a pastor or deacon. In recent years, Baptists have extended ordination to include other persons in ministry, such as chaplains, missionaries and church staff members. 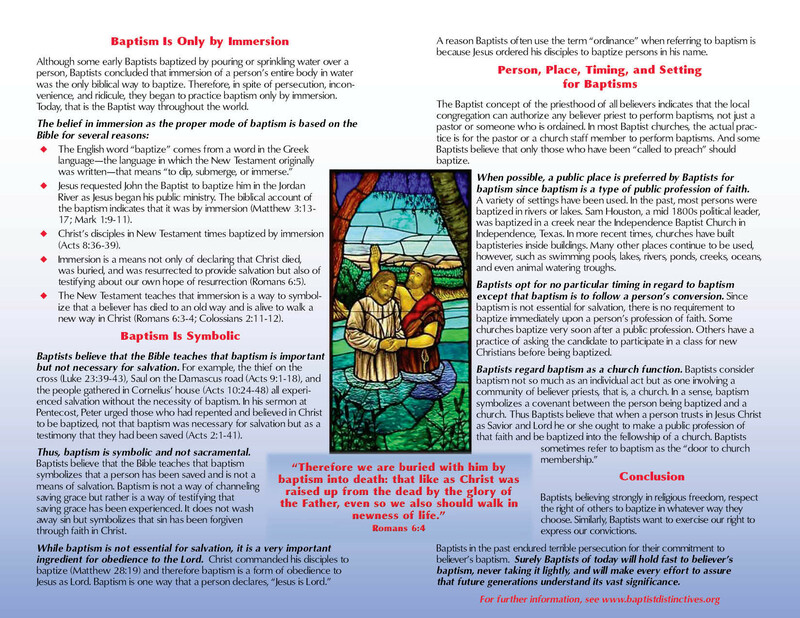 Not all Baptists agree that ordination is necessary or even appropriate. However, ordination is practiced by most Baptist churches and is considered valid for a lifetime. Thus, when a person moves from one church to another as pastor or deacon, there is no need to be re-ordained. For Baptists, ordination is a function of an individual church, not of the denomination. Although other churches or denominational entities may be asked to participate, a church is the body that actually ordains. In the case of pastors, ordination is usually preceded by licensing the person to the gospel ministry. Licensing ushers in a period when the church and the individual can evaluate whether the person is indeed suitable for pastoral ministry. If the person testifies to an internal calling by God through the Holy Spirit to the gospel ministry, evidences the biblical qualifications for the office and demonstrates the gifts necessary for effective pastoral ministry, the church proceeds with ordination. 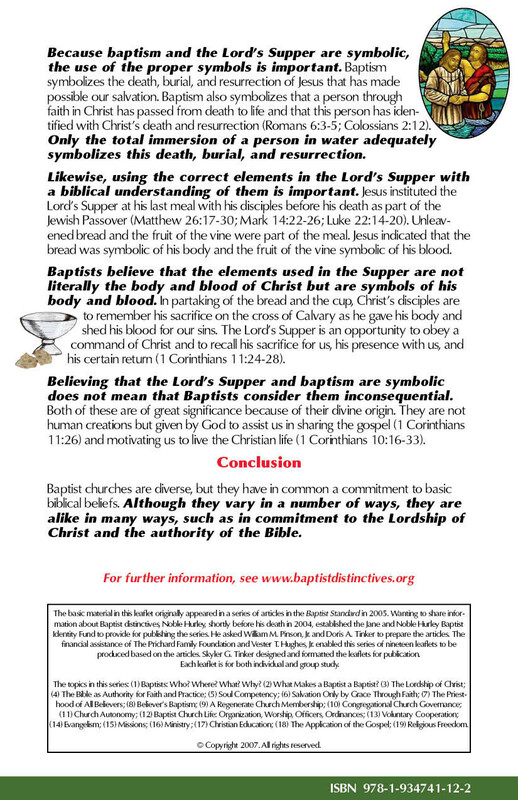 Baptist polity concerning pastors and deacons relates to other Baptist distinctives. 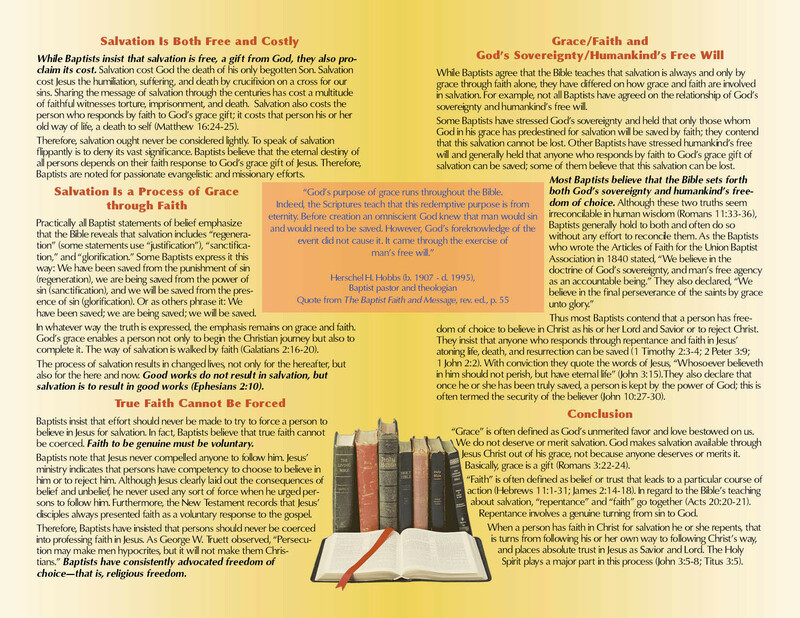 For example, the Bible is the authority for Baptist faith and practice. 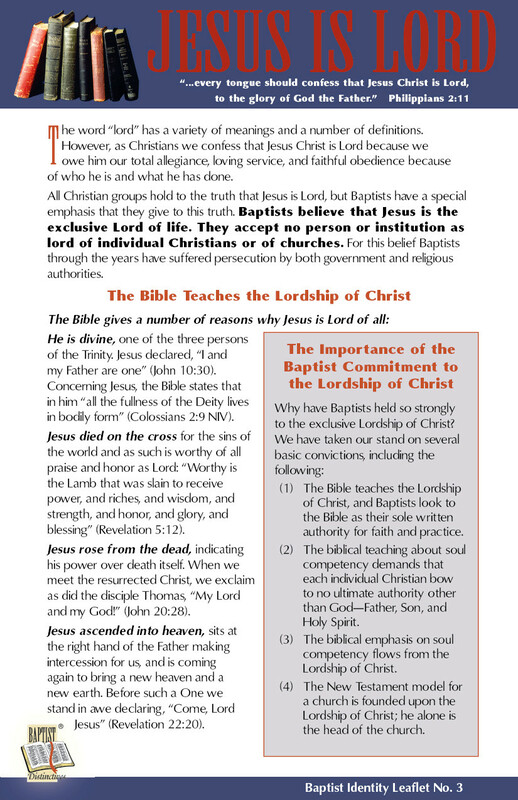 Baptists interpret the Bible as indicating there are two offices in a New Testament church—pastor and deacon. The Bible teaches that all persons who believe in Jesus Christ as Lord and Savior are priests with direct access to God (1 Peter 2:5; Revelation 1:6; 5:10). There is no need for a special priestly class (Hebrews 8-10). Thus, Baptists do not use the term “priest” when referring to the pastor nor consider the pastor as functioning in a priestly fashion, mediating between them and God. Baptists believe the biblical concepts of the priesthood of all believers and of soul competency do not undermine the important role of the pastor. While all believer-priests are equal, some are called by God and selected by the church members to be pastor-leaders. Believers are not to abdicate to pastors their responsibility to study and interpret the Bible and to seek Christ’s will and to follow him as Lord of life. 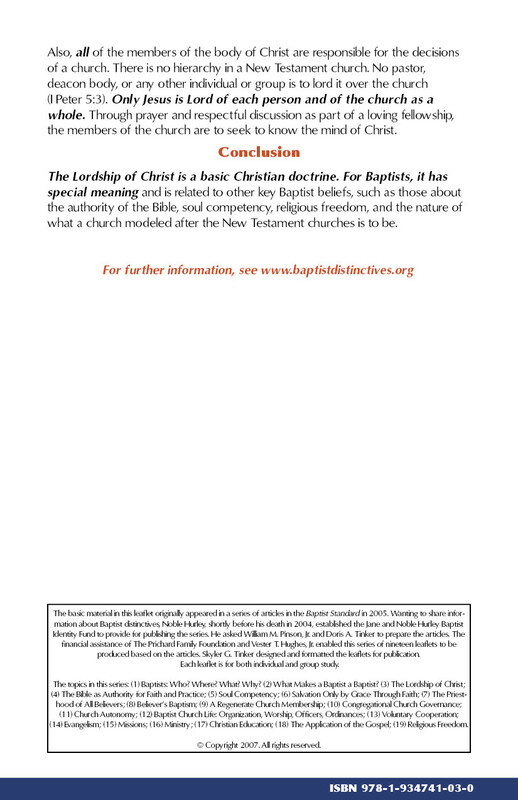 Baptists believe in congregational church governance and the autonomy of churches. Therefore, pastors are not appointed by some entity outside of the local congregation. Each congregation is responsible for the selection of its pastor and deacons. Governance is in the hands of the church as a whole, not the pastor or deacons. The Bible indicates the pastor is to exercise strong leadership, not dictatorship (1 Peter 5:1-5). Freedom and autonomy afford rich soil for differences to develop in Baptist life. This is the case regarding pastors and deacons. For example, during the history of Baptists, churches have used various titles for the person serving in the office of pastor. Baptists differ on whether both men and women should serve as pastors and deacons. The number, requirements and function of deacons also vary from church to church. Although differences exist among Baptists regarding the offices of pastors and deacons, Baptists agree God established these two vital positions to provide servant leadership for churches.